My angel, the light of my life passed from this world at 2:57 pm today. She was in my arms when she passed and her daughter was sitting next to her and holding her hand. Our grandson was standing beside us as well so she was surrounded by people who love her when she moved to the other side. 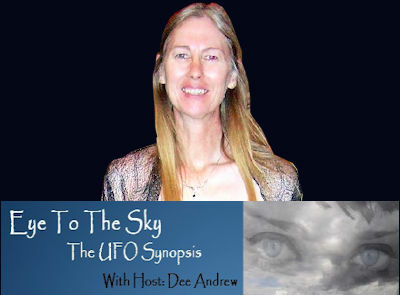 Dee Andrew has been an avid UFO researcher for over forty years. Her personal journey as a UFO researcher began at age ten when she came across the book, “Flying Saucers-Serious Business” by Frank Edwards at the school library. As a voracious reader, she has amassed a huge collection of UFO related books and material. Included in her research efforts, Mrs. Andrew is also the National Director for the International Community for Alien research (I.C.A.R.). Because she has researched and collected so much information on so many cases she is considered ICAR’s ufology historian as well as its resident expert on the Roswell incident. As a trained abduction investigator she has worked many abduction cases for ICAR. UFO sightings are nothing new to her because she has had several sighting experiences of her own. She has been interviewed for a local television news story on UFO’s and was featured in an interview in UFO Magazine. Having published several online articles, her research and her efforts with the Eye to the Sky radio program have led to many of the top researchers in ufology being familiar with her work and her name.